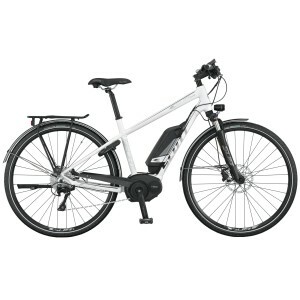 OUR RENTAL BIKES – The best Hybrid Bikes, E-Bikes & Road Bikes for a good price! Genius Loci Travel is a tour operator, NOT a rent-a-bike service! Therefore our bikes are exclusively used for our own cycling tours all over Italy and our fleet is renewed every 2 years (maximum). What clients write: “Firstly, the bikes that we had for our week cycling were first class. Our whole group appreciated this. The best I had on any bike tour in Italy! For all our Cycling Tours (Individual ‘selfguided‘ Tours and Group Tours) we supply good quality 24 gear aluminium trekking bicycles (such as GIANT Roam and FRW Pearth). The bicycles come equipped with rear luggage carrier and bags, cycle computer, bicycle lock and repair kit for flats. They are available in several different sizes (please indicate the size you need – or contact us directly for more information). All bikes are completely checked before each tour. On request we can provide helmets (2 euro/day). 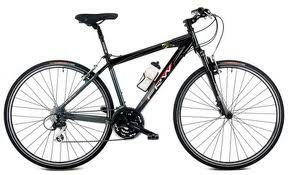 Please contact us for available bikes and prices. 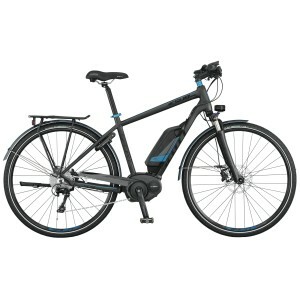 For a limited number of ‘Self-guided’ Cycling Tours, as well as for some special E-Bike Tours, we can offer the best available E-Bikes, among which the amazingly beautiful Scott-Bikes with a powerful Bosch-battery, the best on the market. All bikes are completely checked before each tour and are delivered with the batteries fully charged. Please check here which size suits you best. 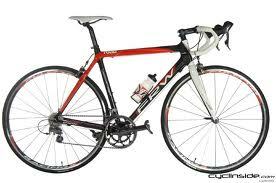 Please contact us for available bikes and prices. For our Bike Challenges (Individual & Group Tours) you may want to bring your own bike, but from our experience this might prove more expensive and complicated. We offer high quality carbon frame road bikes with Shimano 105 Compact gear group, or equivalent (such as FRW Diamond Heights). The bicycles come equipped with 2 bottle cages, cycle computer (on request a Garmin Edge Explore 820 can be mounted; 5 euro/day), repair kit for flats and saddle. The bicycles are available in several different sizes (please indicate the size you need – or contact us directly for more information). Your bicycles are of course completely checked before each tour. Please bring your own shoes & pedals and you may want to bring your own saddle. On request we can provide all kind of pedals (without surcharge). On request we can provide helmets (2 euro/day). Please note that bike types can differ slightly from the ones described below. We use different bike suppliers in the different regions, in order to be able to give you the newest bikes and the best quality/price ratio. All are of equally good quality. On request, in several areas, also MTB’s and gravel bikes are available. Cycling along the Amalfi Coast and through the Cilento National Park, you should wear the right jersey!!! And pay the right price! For only € 40 (!) we can provide you with a high quality (Nalini – Made in Italy!) short sleeves summer cycling jersey – either with half zip or full zip.